Combine all the crab cake ingredients in a bowl (reserving one cup of Panko for the coating). Form into 4 patties, about 1 inch thick. Place remaining Panko in a bowl. One at a time, place the patties in the Panko and press until well coated on all sides with bread crumbs. Place on a plate and refrigerate until ready to use. In a pan over medium high heat, cook the bacon, turing frequently, until crispy and cooked trough. Remove the bacon and set aside. Once the bacon is removed, add the crab cakes to the pan, cooking in the bacon grease until golden brown on the underside, flip carefully and cook on the other side until cooked through, about 3 minutes per side. Remove from heat. In a food processor, add the bacon, process until only crumbs are left. Add the egg yolks and process for about 3 minutes. Melt the butter in a pot on the stove (or in the microwave) until hot and steaming. While the food processor is running, slowly, slowly add the butter until well combined with the yolks. Add the lemon and the cayenne, process until combined. If your sauce is too thick, add water to thin, about a teaspoon at a time. Poach the eggs in simmering water. 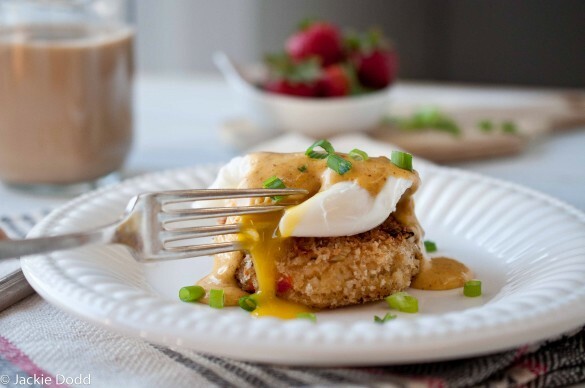 Place one crab cake on each plate, top with poached egg, then sauce.